MMA, in affiliation with Docquity, is announcing the launch of a doctor’s only professional network. The application will enable MMA members to professionally connect and create an engaging MMA doctor’s community. Upon installation of the application on your mobile devices, start having a private & secure real time discussions of utterly anything to any individual, colleagues, or even groups on the private & secure platform. MMA will be regularly posting upcoming events, latest announcements and more on the “What’s Trending” page in order to keep the members up-to-date with MMA. Join the private & secure network with 3 easy steps and be a part of something phenomenal. The possibilities are in your hands. See you on the network. 2. Click on Join and provide your IC number to claim your profile. 3. Update your profile and build your professional network. 30, 000 ++ “Conversations” initiated. Contest Opens 28th March 2016 and only valid for SCHOMOS & MMA members. 1. Contest opens from 28th March 2016 till 15th April 2016. 3. Minimum of “8 registrations” from invites sent per member to be able to qualify for the contest. 4. 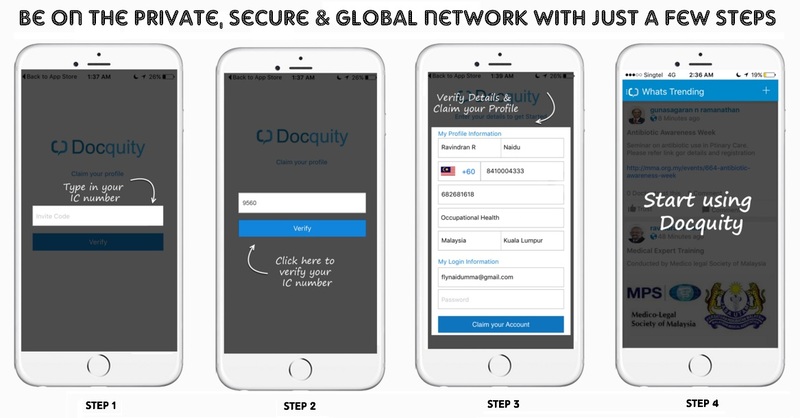 Docquity will publish the leaderboard on the Docquity App every 3 days, since the contest launch. 5. Final decision will be taken by Docquity. 1. Download Docquity from “App Store” or “Google Playstore”. 2. Join the network through your IC number. 3. Go to “Find Peers” & click “Grow your network”. 4. Send Invites via “Whatsapp” or “SMS” to your Peers & Colleagues registered with MMA & Win! 1. Thank you for being an lead influencer on the fastest growing medical network. 2. Help grow the network further by going to “My Connections” & click on “Grow your network”. 3. Send Invites via “Whatsapp” or “SMS” to your Peers & Colleagues registered with MMA & Win!